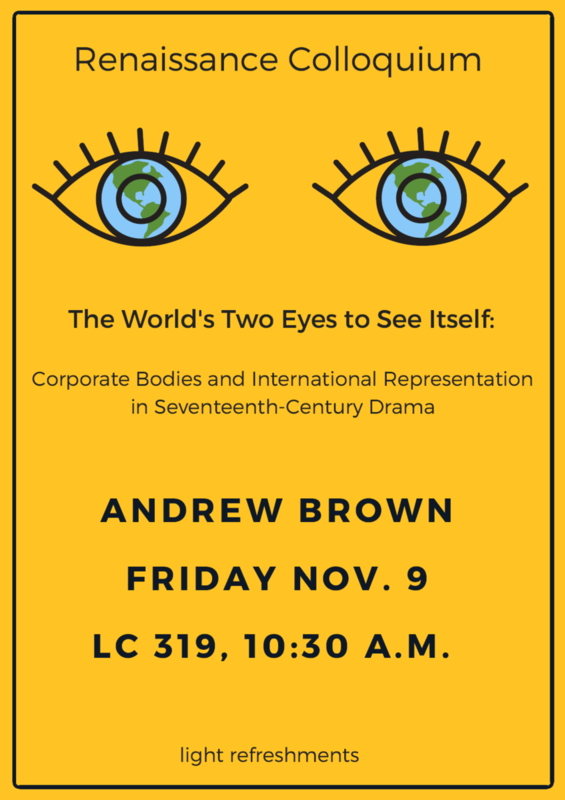 Abstract: This talk engages with early modern ideas of international law and globalization by analyzing how English playwrights portrayed colonial “contact zones” that lay outside the bounds of formal diplomacy. Unlike ambassadors, who were officially charged with bearing the words and person of the ruler to other realms, figures like merchants, factors, and soldiers—what we might describe as the nation’s informal representatives—were typically thought to serve as both “public” and “private” persons simultaneously, promoting the interests of their country or the companies they served while also pursuing their own aims. Through readings of John Fletcher’s The Island Princess (ca. 1621) and Philip Massinger’s The Renegado (1624), I argue that attending to such figures ultimately allows us to reorient past readings of early modern law, commerce, and racial formation. Bio: Andrew S. Brown is a sixth-year PhD candidate in the English department. His work examines how English playwrights from William Shakespeare to John Milton helped to develop the concept of representation: the idea that the words and actions of one person, group, or thing could stand in for those of another with affective, social, legal, and political force.